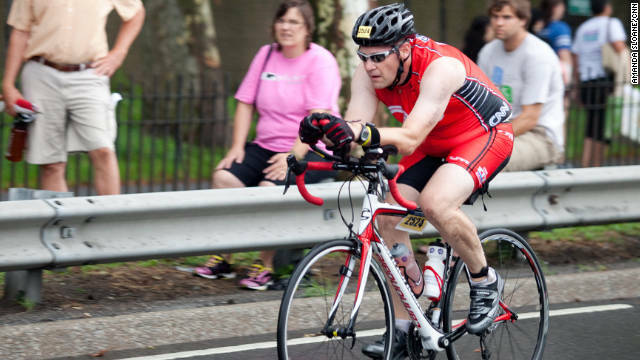 Dr. Scott Zahn was one of six CNN viewers chosen to be a part of the 2011 Fit Nation Triathlon Challenge. He trained with Dr. Sanjay Gupta and raced the New York City Triathlon on August 7. Since then Zahn has kept up his new healthy lifestyle and recently signed up to race a Half Ironman next year. CNN is looking for viewers like Zahn to join our 2012 Challenge. Click "Share Your Story" to apply. Anniversary noun: A date that people remember because something important happened on that date in the past, as in a wedding anniversary. Today I am celebrating a health and fitness anniversary. November 10, 2010 was the day that I entered the CNN Fit Nation Challenge and decided that I needed to make some changes in my life to lead a healthier and fit lifestyle. The reasons that I entered the challenge were many, but primarily I needed to do it for myself. I needed to take charge of my health. The journey started the following day with a trip to the gym to start the process. Over the next several weeks I was committed to the workouts and eating healthier, but really wanted to be part of the Fit Nation Challenge. I checked out the CNN website daily to see who else wanted to be part of the Six-pack. “Certainly they would pick me over that guy,” I kept telling myself. I was convinced that I would be a perfect choice to be part of the 2011 Fit Nation Triathlon Challenge. I would try to guess which other five they would pick to be with me. As the weeks progressed, I became more nervous that I hadn’t been chosen. Then on December 23 the call came. Dr. Gupta called my house –- I wasn’t home. He called my office –- I was with patients. Finally, when the day was over I checked my cell phone and there was the message from Dr. Gupta telling me that he wanted me to be part of the team. Obviously, I was excited! The next eight months were a whirlwind of exercise, eating healthier, travel, interviews, blogs and everything else that has been part of the 2011 CNN Fit Nation Challenge. The results have been remarkable – 60-pound weight loss, being weaned from all my medications, improved blood tests and a more active and healthy lifestyle. The challenge culminated with the 2011 Nautica NYC Triathlon. I swam a mile in the Hudson River, biked 25 miles along the Henry Hudson Parkway and then ran 6.2 miles through Central Park. Before the challenge I had never done any of those events and now I have done them all in a row. I am a triathlete - I swim, bike and run. Now is your chance to change your life and set your own health anniversary. CNN Fit Nation is now accepting applications for the 2012 Fit Nation Triathlon Challenge. The goal is the 2012 Nautica Malibu Triathlon. This is your opportunity to join Dr. Gupta and five other people ready to change their lives. It is time to take control and begin a healthier, more active lifestyle. Surf’s up, dude. Malibu awaits. I’ll see you there. Color and pictures, especially like mint green, although somewhat tortuous process, customer Chun Yu Oh well both color and shape and the same picture, feel good, I feel tall on, very happy, very worth buying wild color, style is very Pop, portable, shoulder can be, just the right size, the New Year back just color is very good, the color is very fond of, the quality is also very number, a good sense of the cortex, praise, praise the color is pink, no color, participate in activities the price is very favorable, the bag is very practical, I am very satisfied with the color is very bright, tough good, simple and elegant style very wild, very on the grade, work is also very fine.